Posted By:Unknown | At:1:43 PM Be the first to comment! The Democrats appear to have a hard time calling the Republicans liars for the things they are saying, but I don't have that problem. I like to call a spade a spade and this time I'm calling the Republicans liars. One of the biggest liars of recent has been vice presidential nominee Paul Ryan. Who, in his acceptance speech, told more lies than the fact-checkers could keep up with. One of the biggest untruths the congressman from Wisconsin told was that President Obama was responsible for the closing of a GM which in fact closed under George W. Bush. 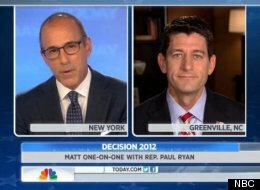 In an appearance on the Today Show, Matt Lauer called Ryan out on how loosely he played with the facts in his acceptance speech.